How frequently do you get the chance to navigate a simple trail in the Himalayas that has a great deal to offer? Or a trek expedition which is so easy that beginners can easily do? Deoria Tal - Chopta - Chandrashila Summit Trek is the response to that. A wide assortment of scenes, emerald lake, thick rhododendron woodland, sacred Tungnath Temple and all encompassing perspectives of the Himalayan reach from Chandrashila Summit are key highlights of this trekking expedition. Perfect Sunset view and reflection of himalayan peaks on Deoria Tal. Lake with mythological significance dating back to Mahabharata. Tungnath : highest temple of Lord Shiva and one of Panch Kedar. Note: The costing is for Indian Nationals only. Additional charges will apply for Foreign Nationals due to permits and camping/entry fees. Rohini Bugyal trek will not be possible during winters from Mid December to March, as most of the trail will be covered with snow. However, it will be subject to amount of snow and trek leader/guide decision will be final. In that case the Option 2 will be applicable. Reach Sari Village and meet our guide, who will give you quick briefing and refreshments. Sari village is the starting point of the 2.5 km trek to Deoria Tal. Gradually ascending trail through the forests of rhododendron, alpine and oak trees will end up at Deoria Tal. The path is well made and broad too. It just takes one and a half hour to reach Deoria Tal from Sari Village. Deoria Tal is a gorgeous lake nestled amidst elevated meadows with few huts nearby that provides accommodation. Deoria Tal is situated at an elevation of 2,400 mts above sea level with picture perfect location and backdrop of the mighty Chaukhamba peaks. The reflection of Himalayan range on the pristine waters of this lake is a view that will be etched in your minds forever. After early morning exploration of Deora Tal, we will quickly have our breakfast. After that we will start our trek. The trail to Rohini Bugyal doesn’t involve much steep climb and there are several ups and downs during this stretch. The route passes through some of the most beautiful forests rich in a wide variety of flora. Red and pink colored Rhododendrons (during spring) will greet you at every step. You need to cross Jhandi Dhar while trekking towards Rohini Bugyal. 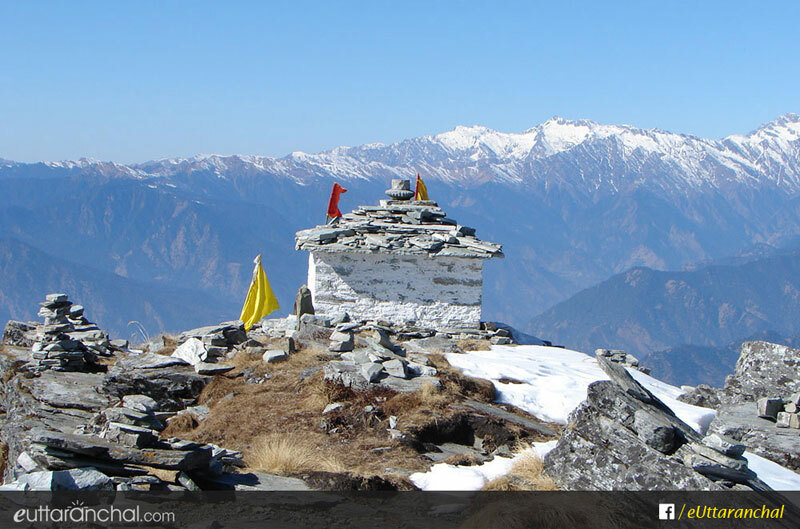 Jhandi Dhar (2,650 mts) is a ridge top that offers clear views of Kedar Dome and Chaukhamba Peaks. Chandrashila Peak also becomes visible after trekking for a few kilometres. There are very few water points at this stretch so do carry extra water. It is advisable that you carry two water bottles for this trek. Perched at an elevation of 2730 mts above sea level, Rohini Bugyal is a small meadow but a beautiful campsite which offers stunning views of Himalayan peaks. Enjoy packed lunch at Rohini Bugyal. A short hike of 6 kms from Rohini Bugyal ends up at Chopta from there we can either walk to our hotel or campsite. It takes around 6 to 7 hours to complete this trek. Note: Rohini Bugyal trek will not be possible during winters from Mid December to March, as most of the trail will be covered with snow. However, it will be subject to amount of snow and trek leader/guide decision will be final. In that case the Option 2 will be applicable. In this option we will have a relaxed morning and ample of time for Himalayan View, strolling around lake. You can also do bird watching or nature photography. We will descend down after lunch to Sari Village. Drive to Chopta hotel or campsite (transportation is not inlcuded, but can be arranged on extra cost, as per actual). Enjoy evening tea with snacks followed by dinner. You can stroll around, do team building activity along with your group or just relax for next day trek. Start early in the morning for Chopta Tungnath and Chandrashila trek after breakfast. This entire region comes under Kedarnath Musk Deer Sanctuary so there are chances that you might spot wildlife in the morning including Wild Goat and Himalayan Monal. The trail from Chopta to Tungnath temple is broad and well maintained. During today’s trek, you will be gaining altitude in very short distance and thus the climb is all uphill. Tungnath: During the final stretch to reach Tungnath you will reach a rocky cliff on the right which is known as Raavan Shila. Continue walking towards Tungnath Temple. Magnificent in its style and architecture Tungnath is considered more than 1000 years old. The main temple is dedicated to Lord Shiva and other small rock temples in the vicinity are dedicated to Goddess Parvati. The temple remains closed during winters. Chandrashila: Another 1.5 kms steep hike from Tungnath temple will lead you to Chandrashila Summit. The trail becomes narrow as we climb up the meadows of Chandrashila Peak. Chandrashila is the summit of the mountain on which Tungnath temple is situated. A beautiful small temple is situated on the summit along with several unique cairn structures. Chandrashila is perched at an elevation of 4,000 mts above sea level offering splendid views of the majestic Himalayan peaks including Kedar Dome, Chaukhamba, Nanda Devi, Trishul, Nanda Ghunti, Kamet, Gangotri Ranges & more. Burjgali: Spend some time at Chandrashila Summit witnessing the heavenly horizon and then start descending towards Bhrujgali. Chopta is another 1 km downhill hike from Bhrujgali that just takes around 20 min to traverse. Chopta is an emerging hill station that acts as another commencement point of the trek to Tungnath and Chandrashila. Stay in Camps or hotel. Enjoy the morning in Chopta with breakfast. Our trek services ends at Chopta. Tour ends with memories of this majestic trekking expedition at Chopta. Reach out to us to get a custom itinerary of "Chopta - Chandrashila Trekking Expedition" package!